Who doesn’t love coconuts? Coconuts are delicious! They elicit a feeling of sunny days, sandy beaches and palm trees waving in a breeze. Aside from being delightful in your cocktail, coconut water is known for its high electrolyte content and hydration magic (net zero, anyone?). There are more brands than I can count that are now offering coconut water as the perfect post-workout beverage and it doesn’t stop there. Coconuts have benefits that are even more powerful and it’s found in the oil extracted from coconut meat. The oil is touted as being able to help with: immunity, digestion, skin care, infections, heart health, stress relief, oral care, and the list goes on and on. More research is being done every day to nail down all of the little miracles coconut oil is responsible for. 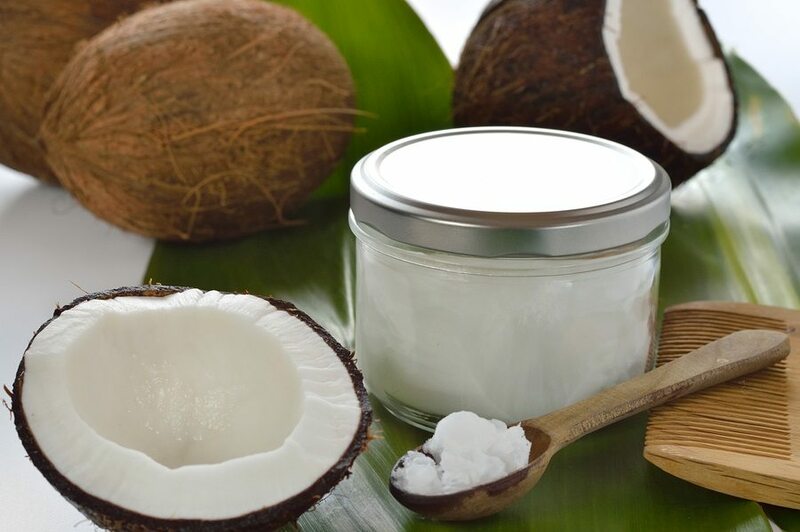 Now there was a time before coconut oil fandom where people believed that the saturated fat would clog arteries, raise cholesterol, and increase risk of heart attack. Turns out, this is only true of oils that have been partially hydrogenated – these types of oils create trans fat and kill off the good fatty acids and antioxidants. Virgin, organic, and unrefined coconut oil have fatty acids (such as lauric and and capric), vitamins (E, K), and minerals that give coco-oil its power. There are so many benefits of using the tree nut, it’s hard to know where to start so we ended up throwing together a laundry-list of uses for you to try out! Feel free to leave us a comment below with your favorites….Happy Oiling! Oral Care | Known as Oil Pulling, swishing a tablespoon of coconut oil in your mouth for 15-20 minutes can help pull out toxins, remove plaque, and possibly even whiten your teeth. This practice has been used for thousands of year in Ayurvedic medicine and is back in action. Coconut oil is a great option for oil pulling because of its sweet taste and aroma. Skin Care | The moisturizer of all moisturizers! Lathering coconut oil all over your body daily will keep your skin super hydrated and super soft. Coconut oil has anti-microbial, anti-viral and anti-inflammatory properties so it is ideal for skin conditions such as eczema and psoriasis and also for any rashes or fungal infections. The nourishment this oil brings to the skin also makes it a go-to for wound care. Cooking Care | Coconut oil is great to cook with as it is a very stable oil and has a very high smoke point at 350 degrees. The oil has tons of beneficial fatty acids and anti-oxidants and is actually good for your heart health! The oil produces a very delightful and sweet taste and is especially delicious in a stir fry, curry, baked goods, tea and smoothies! Hair Care | Frizz beware – coconut oil is the ultimate smoother for your locks. Its also wonderful for applying to the ends of your hair to lock in moisture. You can rub it into your scalp before bed and rinse out in the morning – it’ll strengthen hair and give it a shine! Immune System Care | Coco oil has anti-microbial, anti-viral and anti-fungal properties. Taking just a teaspoon of coconut oil at the beginning of the day can help with fighting off any bacteria or germs that might be making you feel a little under the weather. Cooking with the oil or adding it to your drinks is an easy way to get it into the system. This entry was posted in Earth and Air Wellness, Health Coaching, Nutrition, Pleasant Hill, Seasons, Wellness. Bookmark the permalink.